Virginia E. Shields, age 96, of Caldwell, Ohio, died Thursday, January 31, 2019, at Summit Acres Nursing Home in Caldwell. She was born February 11, 1922, in Noble County, daughter of the late Ollie and Emma Mercer Cline. Virginia was a homemaker. 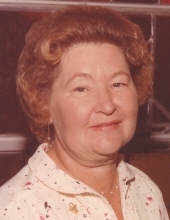 In addition to her parents, she was preceded in death by her husband of 43 years, Edgel W. Shields, whom she married July 11, 1961, and who died February 6, 2003; and her siblings, Hallie Triplett, Helen Clucus, Gertrude Perry, Willis Cline, Sylvan Cline, Sally Long, Eleanor Hastings, and Robert Cline. Surviving are several nieces, nephews, great-nieces, and great-nephews. Friends may call Monday, February 4, 2019, from 11AM-1PM at McVay-Perkins Funeral Home, 416 East Street, Caldwell, where the funeral service will follow visitation at 1PM with Pastor Bill Abrams officiating. Burial will follow at Friends Cemetery in Quaker City. To plant a tree in memory of Virginia E. Shields, please visit our Tribute Store. "Email Address" would like to share the life celebration of Virginia E. Shields. Click on the "link" to go to share a favorite memory or leave a condolence message for the family.